Finally, you add Grimas Blood or Filmblood, depending on the desired effect. Grimas Blood has a light and syrupy texture and a deep red colour. Apply directly from the tube or with a brush. Filmblood is available in two colours: light, oxygenated blood (A) and dark, deoxygenated blood (B). You can apply it directly from the bottle. 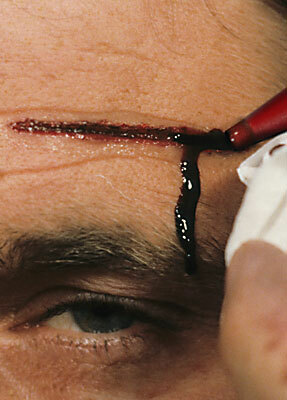 Use a Stubble Sponge or a tissue to disperse the blood around the 'wound', if desired. If a slight film forms on the skin, cleanse it afterwards with Grimas Cleansing Lotion.